Rosalia graduated in Spain in 2009. After spending several Rosalia years working at a practice in her home town Valencia and completing a Postgraduate Degree in Endodontics, she decided to move to the UK in search of new experiences and to expand her knowledge of the English culture and language. 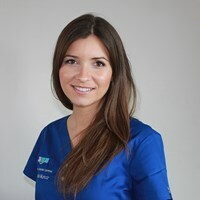 Since entering the UK in 2012 and prior to joining West London Centres in 2014, Rosalia worked in a private and a NHS practice in London. She enjoys restorative dentistry whilst ensuring her patients feel at ease. Alongside her work with us, Rosalia has been volunteering with Burmadent (a charity organisation) in Myanmar (Burma), treating mainly children in poor and remote areas. Rosalia loves travelling, animals, reading and yoga.